Are you interested in diabetes, clinical trials and what treatments may be developed in the future? As part of our commitment to disseminating knowledge to everyone interested in diabetes research and treatment, we’ve designed this to serve as a thorough introduction to the fundamental facts about this disease. We discuss the different types of diabetes and look at prediabetes and diabetes prevention. We also explain how clinical trials are structured, what the different phases of clinical studies mean, and the special considerations for clinical trials in diabetes and obesity. Finally, we take a look at the future, discussing stem cells in diabetes treatment and speculating on potential future treatments. If you are a professional working in the field of diabetes clinical trials, you may be more interested in our webinars and recent scientific publications. Learn the fundamental facts about diabetes with Profil Germany. See the long route from preclinical to clinical studies in our step-by-step explanation. 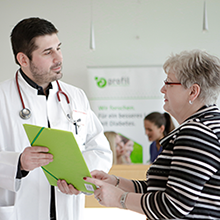 The Profil Institute for Metabolic Research has a commitment to educating everyone on diabetes and obesity. Our webinars and publications are prepared with our fellow scientists in mind but we also want to disseminate knowledge to lay people interested in this important and widespread condition.